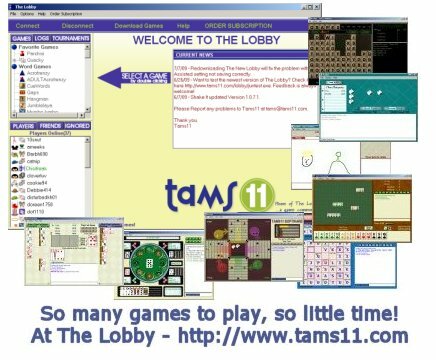 The Lobby allows you to connect with others players to play the Tams11 multiplayer games. 1. 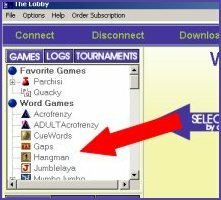 Download The Lobby -see Installation Instructions for help on downloading. 2. Create a New Username by opening The Lobby and pressing the "Create A New Username" button. Fill in the information and press OK and then press the Log In button. You should be connected to The Lobby as your new username. You will only need to create a username the first time you log on. After you have created your username, just enter your username and password in the log in box and press the Log In button. 3. Download the game you wish to play by clicking on the Download Games Button and selecting the game you wish to download. Then press the "Download and Install" button. You will only need to do this step the first time you play a particular game. 4. Join the Game Room Lobby by double clicking the Game Name on the list to the LEFT. 5. In the Game Room Lobby you can either host a game or join a game. To host a game press the "Host a Game" button. To join a game, Double click the game name of the game you wish to join on the list to the RIGHT. To open up The Lobby, go to Start, Programs, Tams11 and click on tams11lobby.exe.